Remember when I said I had a new gig thing happening that I was all excited about? That I was all geeking out and exuberant to be writing occasional posts over at Middle Grade Minded, which—as an added bonues—might hopefully mean not boring you lovely readers so frequently with the insurance-seminar-dull details of what’s bugging me about my latest work in progress? Surely, you remember it? Oh, here, to refresh your memory, the post about it is right here. Anyway…SO! My number came up in the rotation o’ bloggers at Middle Grade Minded this week, meaning that it was finally time to share a thimbleful of my thoughts (it’s all I can spare) on writing for middle graders. 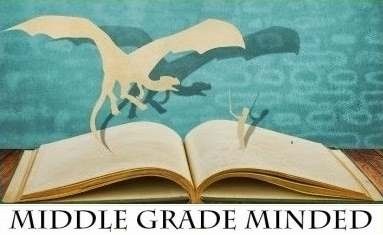 Traditionally, one’s first post for MGMinded is an examination of “Why I Write Middle Grade”. And well, I’m not one to buck tradition. Okay, except for that one custom of eating buffalo wings with ranch or blue cheese. Why would anyone ruin a perfectly good, perfectly spicy fried chicken wing with thick, creamy ick? Oh, also, the tradition of hanging heavy things overhead for “good luck”. Someone with questionable skills with weapons of mass destruction hand tools should probably not be hanging concussion-inducing iron horseshoes overhead. I assure you, that’s not going to result in good luck for anybody. The cranial traumatizing effects of gravity when occurring in conjunction with poor workmanship aside, the good news is that I think Middle Grade Minded’s tradition of starting with a “Why I Write Middle Grade” post makes a ton of sense. I was delighted, then, to follow along. And that’s exactly what I did for my first MGMinded post, which just went live this morning. If you’re the bookish type or a writerly type, why not skip on over there and check it out? Don’t worry, we’ll be here when you get back. Probably still complaining about ranch dressing while side-eyeing that hammer. Have a great weekend! And, uh, don’t set the place on fire.